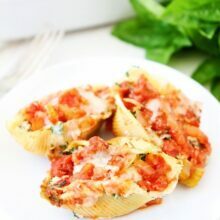 Roasted Vegetable Stuffed Shells-pasta shells stuffed with roasted vegetables, marinara sauce, and lots of cheese! This easy baked pasta dish is perfect for weeknight meals, entertaining, and it freezes well too! My love for cooking hasn’t gone away, but it has been put on the back burner. Life with a newborn, toddler, and blog has been an adjustment. Maxwell is a good baby so we are getting decent sleep, but I am still tired and still trying to find enough hours in the day to get things done. I am not complaining because I love my life with my boys, life is just different. Cooking dinner is not at the top of my to do list anymore. I know we all need to eat dinner, so we do, but dinner has become super simple. 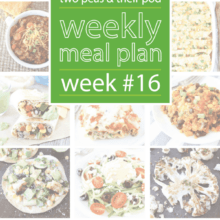 I have been relying on 15-30 minute meals, leftovers, freezer meals, and yes, even cereal. Freezer meals have saved dinner hour on numerous occasions. When (and if) the boys are napping I will try to make a few recipes that we can tuck away in the freezer. 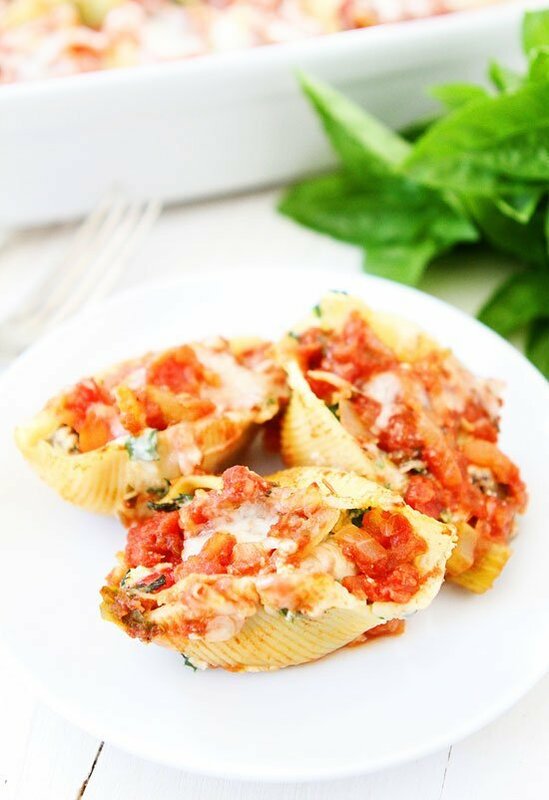 One of my favorite freezer friendly meals are these Roasted Vegetable Stuffed Shells. They are easy to make, freeze beautifully, and are a lifesaver on those days when I don’t have time or the desire to cook dinner. I love making stuffed shells because our entire family likes them. There is no whining at the dinner table. Yes, sometimes Caleb complains about what we make for dinner…but not on stuffed shells night. He loves eating the sea shells:) You can find large pasta shells in the pasta aisle, we like using DeLallo’s Jumbo Shells. You can try searching for them at the beach, but good luck with that…ha! 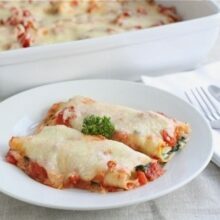 I love these stuffed shells because they are loaded with lots of veggies! I like to use whatever veggies I have in the fridge. This time I used zucchini, eggplant, and red pepper. I roast them and add them to a cheesy spinach mixture! I top the shells with marinara sauce and more cheese! I like to use my Easy Marinara Sauce because it is easy and so good! Pasta with lots of veggies, sauce, and cheese…you can’t go wrong! 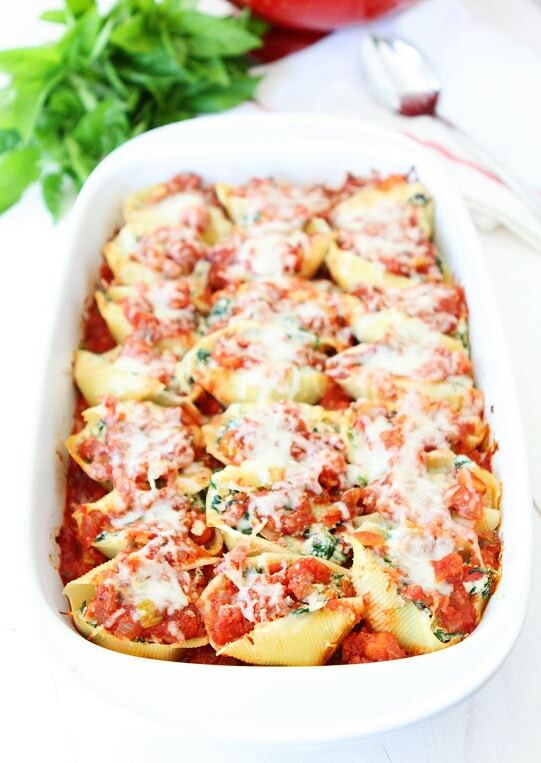 Roasted Vegetable Stuffed Shells are always a hit at our dinner table! And mama likes them even better when I pull them out of the freezer and just heat them up! Doing a little extra work ahead of time is so worth it! These freezer friendly stuffed shells have come in handy at our house a few times in the last two months. And if you are in the mood for more stuffed shells, make sure you check out Ali’s Butternut Alfredo Stuffed Shells. Don’t they look amazing? Talk about great fall comfort food! I can’t wait to make them. Yay for stuffed shells! 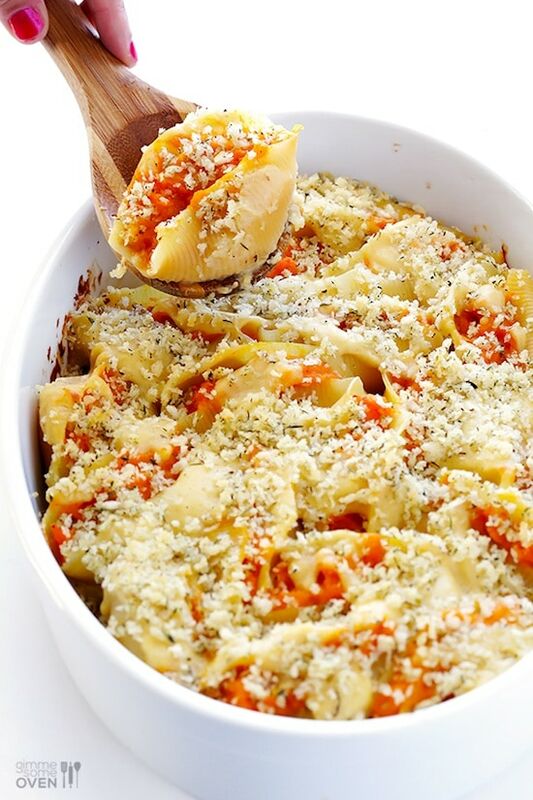 Make sure you add Roasted Vegetable Stuffed Shells to your dinner menu! You can enjoy them fresh out of the oven or put away a pan in the freezer! They are good either way! Enjoy! Cheesy stuffed shells with lots of roasted veggies! This pasta dish is a favorite at our house and it freezes well too! Preheat oven to 400 degrees F. Place the diced red pepper, eggplant, and zucchini on a large baking dish. Drizzle with olive oil and toss. Season with salt and pepper. Roast for 20 minutes, or until veggies are tender, stirring once. Remove from oven and set aside. Turn the oven down to 350 degrees F.
Cook the pasta al dente, according to package directions. Drain and place the shells on large plate or cutting board so they are not touching. This will prevent them from sticking together. Meanwhile, in a large bowl, stir together ricotta, egg, 1/2 cup of the mozzarella cheese, Parmesan cheese, spinach, roasted veggies, basil, and oregano. Season with salt and black pepper, to taste. Pour 1 cup of the marinara sauce into the bottom of 9 x 13 baking dish. Stuff each pasta shell with a generous amount of the roasted veggie ricotta mixture, and place in the baking dish. Cover shells with the remaining sauce and sprinkle remaining mozzarella cheese over the top. Bake covered with aluminum foil for 25 minutes. Remove the foil and continue baking until the top begins to brown and the sauce begins the bubble, another 10-15 minutes. Garnish with fresh basil, if desired, and serve warm. Note-For easier filling, fill a gallon ziplock bag with the roasted veggie ricotta filling and cut a hole off the corner of the bag. Pipe the filling into the shells. The stuffed shells freeze well. I like to bake the pan, let them cool, and then put them in a freezer container. Reheat when ready to eat! I love freezer meals…and pasta, of course! Can’t wait to make this! 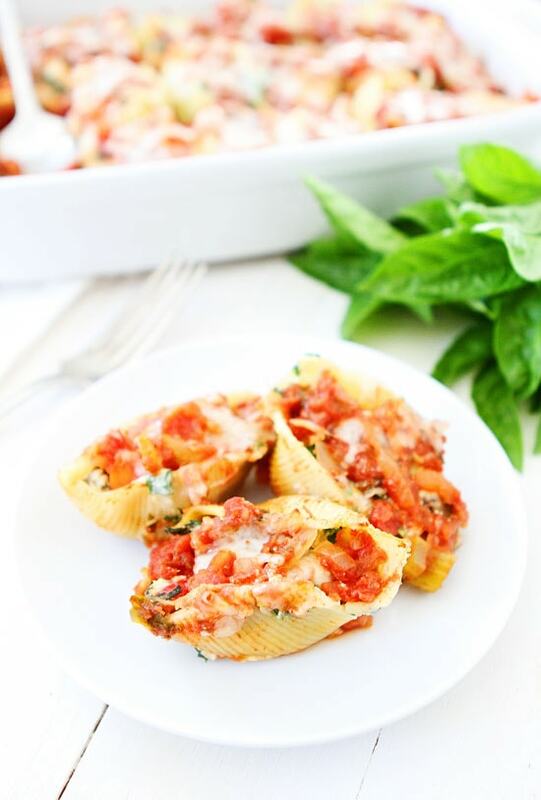 I love all those veggies stuffed inside of pasta shells! I would have to skip the sauce because my youngest is allergic to tomatoes, wonder if alfredo would go good as a relacement? I thought I was the only person allergic to tomatoes (and I am half Italian). Did it work with Alfredo sauce? I bet alfredo would be good! For some reason I’ve never made stuffed shells. I need to change that! I especially love that these can go in the freezer! This sounds wonderful. Will be making this over weekend. Perfect dinner! Love stuffed shells…so do the boys! 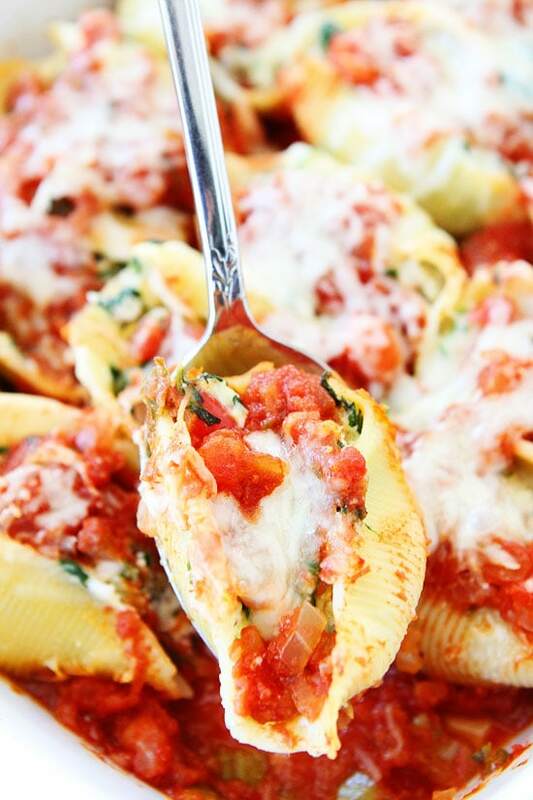 These stuffed shells sound perfect! My kind of dinner. And I love that they are easy to put together to, and can freeze well. I need to do more of that! You are amazing girl! XOXO. These shells look perfect. Pinned and can’t wait to try them out! 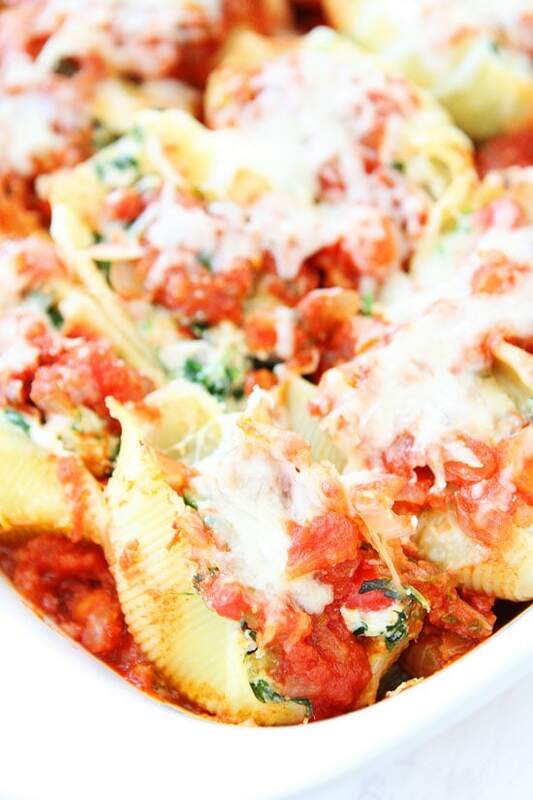 Just what I need to get over the hump this week….stuffed shells with cheese and veggies! YUM!! Oh my gosh, either that’s an incredibly good photo you took or that is amazingly delish. Likely both! It’s breakfast time and I’m drooling over here!!! Sucker for anything Italian. This looks amazing! Easy pasta meals are always welcome here too. This dish is lovely!!! Whoa. I love love love stuffed shells and I love the spin of using roasted root vegetables. This will be a great fall or winter dish 🙂 Glad this can be made ahead and frozen…can’t have too many of those! DeLallo is da’ bomb. I like how you used eggplant in the recipe, that poor veg seems to always get shoved to the side of the limelight. How would you freeze these? In the pan or a ziploc freezer bag?? We love DeLallo! See the note about freezing:) I like to bake the pan, let them cool, and then transfer to freezer container. A bag would work but they might get squished…at least in our packed freezer:) You can also freeze individual portions for lunches! Stuffed shells are the best! I love that you can make a huge batch and freeze them for later. I just started really cooking again…the way I used to! I was honestly afraid I lost my love for cooking for a bit, I think it was because I was tired and hormonal lol. And busy!! I could eat this every day of my life!!! This looks so delicious Maria! Perfect weeknight meal! Stuffed shells are the best. I love trying all the different kinds and coming up with new ones. Gonna have to try this too. Gorgeous! Your pictures are so pretty! I’ve been following your blog for a bit now. I’ve made a few of your dessert/muffin type things. My husband LOVES them. I just made your brown butter pecan pumpkin muffins. I doubled the recipe. My husband told me that we couldn’t freeze any of the muffins for when his parents came to visit but that we would have to make more cause he was gonna take a bunch to work and share them. Anyways, I had some eggplant in the fridge that we needed to use but my hunny HATES most veggies, he grew up in a very meat and potato kind of family where the only veggies they had were canned green beans, corn, and plain iceberg lettuce for the salad. I on the other hand grew up in a very culturally diverse food home. Anyways, I really wanted him to be able to like eggplant cause I LOVE this veggie (he also doesn’t really like zucchini or bell peppers). I decided that I would make this recipe and stuff the filling into manicotti so he couldn’t see the filling and visually wouldn’t be turned off. The best part, I made this when his parents were here for a visit (the first night they were here). They all LOVED it and were shocked at what is in it. THANK YOU, THANK YOU, THANK YOU for such an amazing veggie dish and for helping to open the eyes of my veggie hating husband and in-laws. This is an incredible dish and we have liked ALL of the food we’ve made from your website. Great recipe! I could sneak all kinds of veggies in here! Oh my word Maria, this look divine! 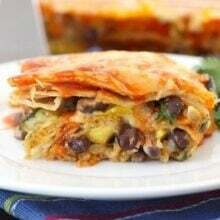 Comforting and packed with veggies! I made these last night. With a tray for the freezer as well. Delicious! I think the recipe looks great! Quick note- I think the link to Ali’s Butternut Alfredo Stuffed Shells is not working. Thanks! Thank you! 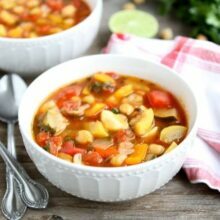 I will be making these for Christmas for my newly vegetarian son! I was stressing over this because our Christmas dinner is ALWAYS lasagne (loaded with meat sauce) and ham!! Not exactly veggie friendly. I will add these into the rotation – and love that I can freeze them ahead of time! Do I roast the veggies in a baking pan like a 13×9 pan or a baking sheet? Thanks so much. I made them and added garlic. I had filling left over though even after making 25 shells. Yum – I made these last night and they were great! My husband made the marinara sauce earlier in the day. Everything was so easy. My 4 and 3 year old even ate them, which is always a huge win. Now I can’t wait to have the leftovers for lunch this week! My husband is the cook and I am the baker. Every once in awhile I have to step up to the plate and make dinner. I made this tonight and we both loved it! It was very easy, affordable, and we have plenty leftover for lunches! Thanks for a great recipe! I always substitute cottage cheese for ricotta. It must just be me but I always feel that ricotta cheese is watery and tasteless. I had a recipe a long time ago that used cottage cheese in lasagna and have substituted it ever since. Everyone loves my lasagna so why not. The cottage cheese has less calories if you’re watching your weight but that’s not the main reason for my substitution. Can’t wait to try these shells out. They look yummy. This dish is a huge crowd pleaser, even in my food snob circle of friends/family. I come back to this site regularly to get the recipe to make it for small gatherings! Hello! I have a friend who is expecting her first little one in just a few weeks. I have made this delicious meal once before and was thinking it would be a good one to share with her once the baby arrives. How do you suggest reheating it after it’s been frozen? Does it need to thaw overnight before putting it in the oven? Should she reheat it at 350 degrees? Thanks for your help! Yes, thaw and reheat! If they are doing the whole pan, they can reheat in the oven at 350 or they can pop individual servings in the microwave! The egg binds everything together and adds moisture, but you can leave it out if you want. I am sure it will be just fine. Enjoy! So creamy and delicious! I never thought to put aubergine and zucchini in a cheese pasta yet it was so good! I didn’t have any eggs left but it didn’t melt outside of the shell and it think it turned out great. It did make a mess of dishes in the kitchen but i don’t mind it given the result! Thanks for sharing the recipe! Glad you liked the recipe! Thanks for letting us know! Could I thaw and reheat in microwave? Or can I just put in the microwave straight from freezer? I’ve had this recipe saved for several years and find myself coming back to it time and time again. It’s always a huge crowd pleaser! My family loved this recipe. I, too used the vegetables I had on hand. Tomatoes, mushrooms, scallions, small amount of sweet onion, green zucchini. Roasted all the day before, with carrots for another use. Small amount of mushrooms chopped up small for stuffing, larger amount cooked a second time outside of the shells. This was to use up the mushrooms and still have my daughter eat the shells by not choosing the large mushroom pieces. I added fresh basil and a couple of handfuls of fresh baby spinach in the stuffing. Don’t remember if I chopped the fresh spinach or not. I don’t remember the recipe being too watery.